Did you know that installing hardwood flooring can dramatically reduce allergens? Fall is here, and it brings with it a new set of allergens. 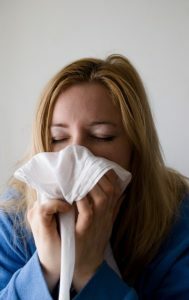 Plus, this is around the time of year when everyone in your home or office starts feeling sick. Did you know that installing hardwood flooring can dramatically reduce allergens? Here are some allergens to watch out for and what you can do to improve your health. Dust mites: You may not be able to see dust mites, but that doesn’t mean that they aren’t there. They eat skin cells that you and your family shed and love to live in carpets, mattresses, and furniture. While they aren’t around for very long (months at the longest) the droppings they leave behind are what aggravates your allergies. Pesticides: Did you spend a lot of time outdoors over the summer? Let’s say that you’ve been tending your garden before the weather cools down and your landscape starts going dormant. Whether you know it or not, you have been tracking pesticides into your home. However, according to the Environmental Protection Agency, it’s far less likely that these chemicals will stick to hardwood flooring. Pet dander: Pet dander is left behind by the cats and dogs you share your home with. So when you have more pets, the more pet dander you’ll have to put up with. You should consider replacing all the carpet in your home and install hardwood flooring instead. That way, you can minimize the amount of pet dander in your home. Keep it clean: While it doesn’t have all of those fibers to trap dust and allergens, hardwood flooring still needs to be cleaned. A simple dry dust mop should do the trick for the day-to-day cleaning. For a deeper clean, you can use a hardwood-safe liquid cleaner. This entry was posted on Wednesday, October 10th, 2018 at 2:43 pm. Both comments and pings are currently closed.